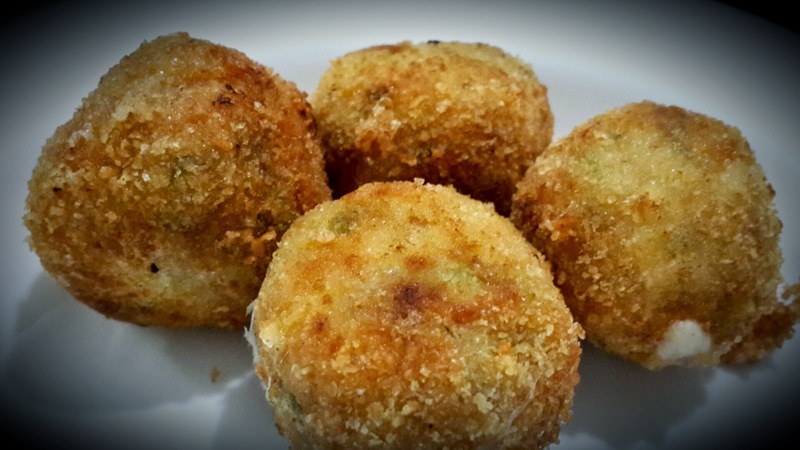 Sharing another recipe that I tried this Ramazan and absolutely loved - Chicken Cheese Balls. I am a huge fan of the Jalapeno Cheese balls at Pizzo - they are filled with melted cheese which literally explodes in your mouth. Since I can't keep ordering from there all the time, this was my take on something similar. Turned out really good especially with the melted cheese inside. This is a recipe that I can see myself making in Ramadan (inshAllah the next one) & on Eid. Put mince with all the ingredients into a chopper or food processor, except flour, cheese, egg and crumbs. When chopping ingredients, don't add them all together into the processor as it sometimes gets clogged up. Keeping the chopper/food processor running, add ingredients through the feed tube so that they get mixed properly. Chop all the ingredients well. The mixture should be slightly chunky (like kofta/meatball mixture) and not pasty. Take mixture on hand, make a round flat disk, put the cheese cube in it and then roll it in a ball. Make all the balls first, keeping them on a tray/plate. Once all the balls are made, roll them in dry flour/maida first, then dip in beaten egg + water mixture, and then finally in the breadcrumbs mixture. Deep fry on medium heat till light golden. Since the chicken mixture is raw inside, make sure you don't cook on high heat otherwise the outside will brown but inside will be raw. The balls can be kept in the freezer and then fried when required.